A choroidal nevus is a benign condition. It is often described as a “freckle” on your retina. It is usually slate-grey in color, of various sizes and can mimic a tumor. A retina specialist is often asked to evaluate anything suspicious in the retina, especially when a tumor is suspected. The nevus is actually a collection of pigmented cells. The nevus is usually grey or perhaps brown in color and does not usually cause any symptoms. It is believed that patients are either born with the nevi or develop them within the first 2-3 decades of life. They are more common in Caucasians. Just like a mole on your skin, a choroidal nevus has the potential to become malignant. Therefore, patients with a choroidal nevus should have periodic dilated eye exams. When possible, pictures of the nevus should be obtained for comparison. An ultrasound can be helpful in establishing thickness of the suspicious area. Additional testing may include a fluorescein angiogram or and optical coherence tomography (OCT). 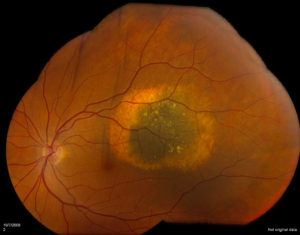 Choroidal melanoma is malignant. The benign nevus is usually very stable, that is, it demonstrates little or no growth. In suspicious situations, it may be wise to re-evaluate a patient after several months – looking for signs of malignancy; growth, leaking fluid, blood or associated retinal detachment. Most specialists regard growth of a suspicious tumor to be indicative of melanoma. Melanoma develop one of two ways; transformation from a choroidal nevus or develop independently. The chance of malignant transformation is quite low, but periodic checks are important. The American Academy of Ophthalmology estimates that a choroidal nevus is present in about 5-8% of Caucasians whereas choroidal melanoma are rare, occurring in about 6 of 1,000,000 individuals. If a melanoma is suspected, referral to an ocular oncologist may be appropriate. If you have questions or concerns, please ask below. I look forward to hearing from you.